On 12th June our summer Education and Outreach Intern presented a paper in Edinburgh on the archaeological excavations undertaken by the John Patrick Crichton-Stuart, or the Third Marquess of Bute, at Falkland Palace after his purchase of the palace in 1887. Here is a summary of the paper. As soon as he had purchased the palace, Lord Bute began archaeological excavations in the palace grounds. Between 1887 and 1900 Bute also renovated and restored the palace (which had been in decline since the 17th century and was in a pretty poor state) and he is responsible for most of the interiors inside the palace today. The excavations ended in around 1892 and focused mainly on the 12th and 13th century castle which had previously been on the same site. Bute was very keen to find the castle and well-tower in which David Steward, Duke of Rothesay, was held by his uncle (Robert Stuart, Duke of Albany) and mysteriously died in 1402. The ruins are below the oak lawn and still be seen in the ground today. Lord Bute did have large scale maps (about 5m by 2m) and plans of the excavations drawn up by the architect working on the restorations of the palace, John Kinross. The maps are colour-coded each according to age of the structure found. Clearly, Bute was keen to record and document his excavations. Pictures of one of the map can been seen on the Royal Commission of Ancient and Historical Monuments of Scotland website. The well-tower of the 13th century castle. The 16th century palace, built by James IV and V, is visible just behind the trees. The patio of the well-tower seen here was completely restored by Bute in order to give a clearer indication of where the tower originally was. The level of the floor (picture above) has very little to do with that of the medieval castle (which is underneath). Bute did ensure that later historians and archaeologists would know that this was his work by using red sandstone for parts of the foundations, a common practice at a number of his restorations to distinguish between old and new work. The red sandstone string course which Bute often used during restoration work. 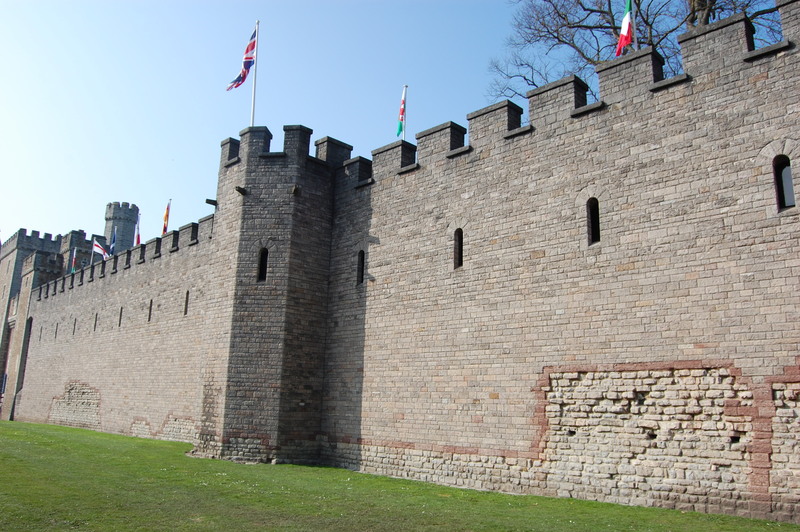 This is the Roman Fort wall at Cardiff Castle, another of Bute’s properties, restored by Lord Bute in the 1890’s. 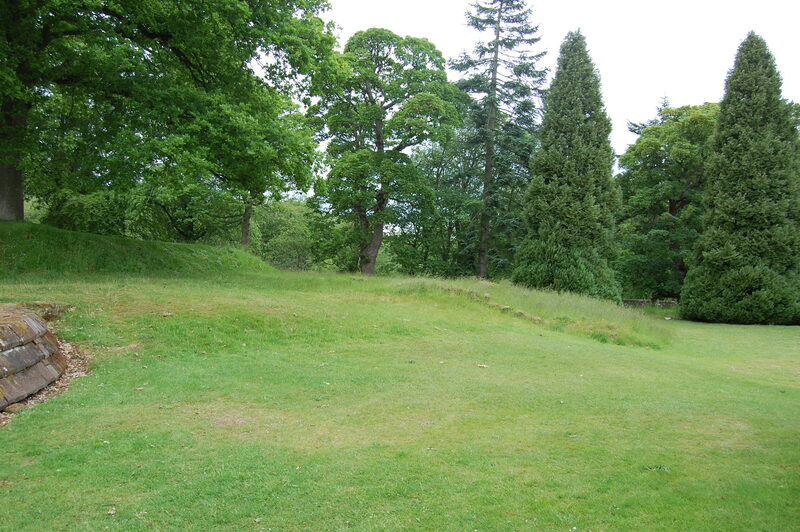 The rest of the castle (found during Bute’s excavations but then back filled with rubble from the restoration of the palace) is hidden under the grass and trees of the Oak lawn. You can see the earthworks and some of the rubble from the old castle in the picture below. The ruins of the 13th Century castle just about visible below the Oak Lawn. This summary, although informative about what Bute interests, tells us very little about what he actually found during digging at Falkland. At other sites, including Rothesay Castle or St Blane’s (on the Isle of Bute) and Cardiff Castle, lists were made of the objects found. However, as Lord Bute was only the Keeper of Falkland Palace, he did not own any of the artifacts and items which he excavated. Hence, as it appears no list of any objects found was ever made, what actually happened to any excavated material is hard to trace. Bute’s archaeological excavations at the palace are fascinating and it is a shame more is not known about them. 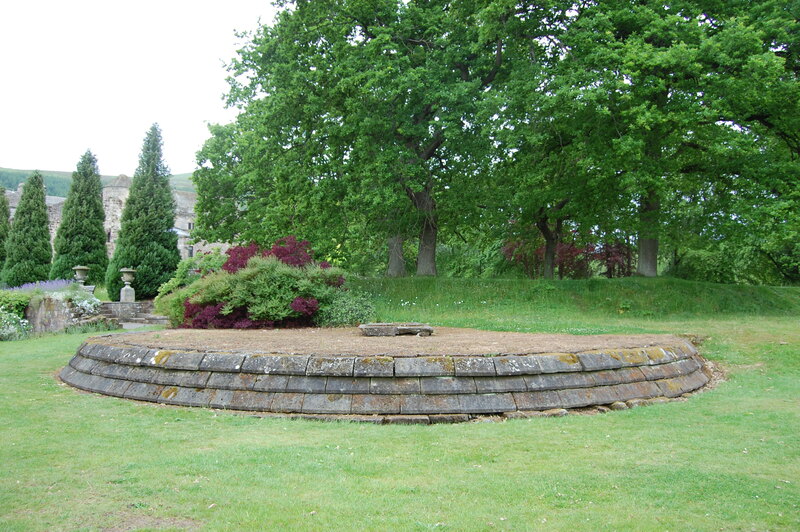 Yet, Falkland Palace is just one of around 60 restoration and excavation projects Bute worked on over his lifetime. It is possible that more information about the excavations at Falkland will come to light when other sites are also investigated. For now, however, we should enjoy the remains of Bute’s excavations and the restored well-tower, and be thankful that he at least left some record of this archaeological work at the palace. Such records were not common practice in the 19th century. On a sunny day, the well-tower and ruins below the Oak Lawn are well worth exploring! 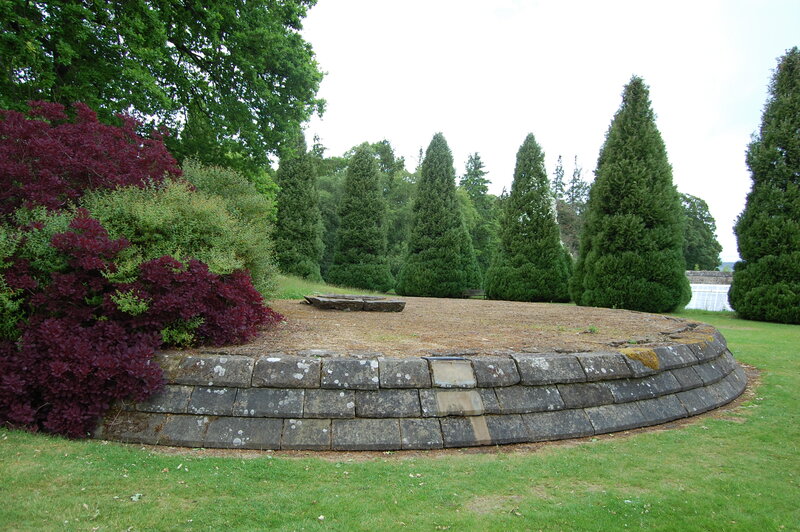 This entry was posted in Falkland Palace and tagged Archaeology, Excavations, falkland palace, falkland palace and gardens, Marquess of Bute, National Trust for Scotland on June 17, 2015 by falklandpalacegarden.